This “Ultimate Planning Guide” is honestly so long overdue, lol. I honestly considered not even posting it at all, but 1) I am trying this new thing where I finish every single thing I have started (it’s quite a challenge) 2) I honestly have wayyyy too much information for me not to share and publish. I have said it before, and I will say it again, but the main reason why I feel motivated and the need to continue blogging about all the knowledge I have gained while traveling is because these are things I honestly wish someone had told me. I feel so much satisfaction knowing my post helps even one person--so here it is! Long overdue, but still here! For a list of my daily itinerary along with how much I spent during my trip (in immense detail) you can read my Cuba Budget Travel Itinerary: How to Spend a Week in Cuba for Under $900. I have also included my complete list of places (as well as the list of other places that I was not able to visit, but that you should add to your list)! 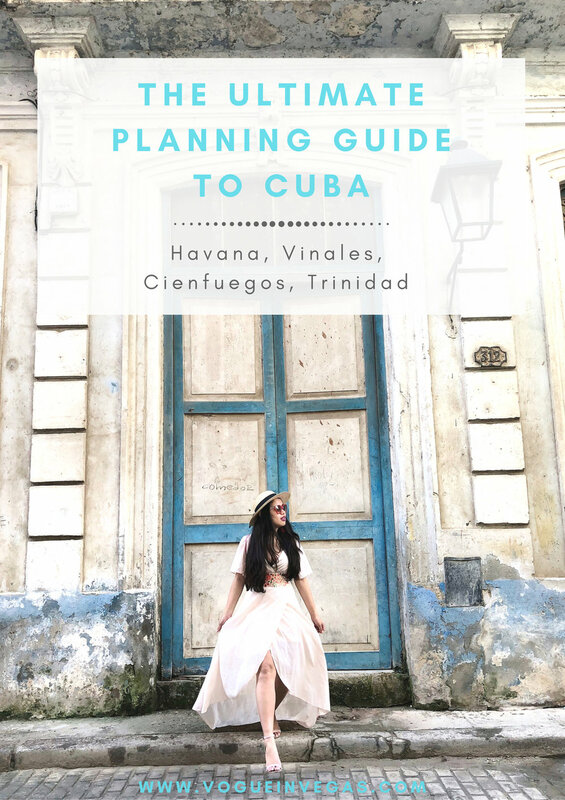 Here is what you can expect from this post: A detailed and comprehensive guide to planning and things you should do before arriving in Cuba and while you are there! I’ve divided this Planning Guide into categories to help you better navigate. Perhaps the most common question I get about Cuba is “is it even legal to go there?” (from my American friends at least). It is no secret that for many years going to Cuba was not exactly the most common route for most Americans especially if you had no actual reason of being there. And now, with Trump’s new policy, Americans are more confused than ever about whether or not travel to Cuba is legal. I am here to tell you that it is and you can even travel there on your own--sans tour group. Essentially, there are 12 categories of travel that permit a U.S. citizen to travel to Cuba. According to the U.S. Embassy website you have to fit under one of these categories in order to legally visit Cuba. So where in the world do you fit in?! If you would like to travel on your own without having to go on a cruise or a tour group, your best option is traveling under the “Support for the Cuban People” category. The only requirement for you would be to actually do things to support the Cuban people and have an itinerary of your trip in case you are ever questioned. How do you ensure you don’t get in trouble? Well for starters, instead of staying at a hotel, stay at a Casa Particular (more on this later) or instead of eating at government run restaurants, eat at Paladares (again, more on this later!). Other ways: touring the city in a classic American car, buying fruit from the local market or a piece of art from a local artist. Basically anything you do to support the people of Cuba! If you are traveling from the U.S. you will need to purchase a visa in the U.S. in order to Cuba. Depending on what airline you choose to fly, you will have a variety of different ways to purchase your visa. I flew on JetBlue so I bought my visa at the gate before boarding my flight to Havana. Flying from the U.S., you will need a Pink Tourist Card. The cost of this card is $50 (this is how much I paid), but as I said, depending on your airline, they may charge you a little more for a processing fee. Typically you can purchase your visa online, via mail or at the gate. Note: If you are purchasing at the gate, prepare to have cash--my gate only took cash. As I said above, if you would like to legally travel to Cuba and actually meet the criteria, one of the easiest ways to do this is to stay at a Casa Particular instead of a hotel. Other than being able to meet the criteria, it is just a better overall experience and really gives you the chance to actually interact with the locals on a daily basis. Plus, most Casa Particulares make you breakfast every morning for a very cheap price, so all the more reason to choose this option! It’s no secret that I love food. I mean I talk about it everywhere, all the time. So when I heard that the food situation in Cuba is not exactly at its best, I was a bit (read: A L O T) alarmed. I know exactly what you are thinking...What food situation? If you do not already know, there is a food crisis in Cuba. No, no one on this communist run island dies from starvation, but they are not exactly rolling in dough either--both metaphorically and physically. Quick History Lesson: Cuba has a “universal ration” system in which its inhabitants utilize to ensure that everyone get enough to eat on a month to month basis. This began in 1962 when the U.S. cut off trade with this Caribbean island causing food shortages. As a result, Cuba struggled to feed its people. While the shortage has eased since then, Cuba does not exactly have an abundance of Big Mac’s and steaks either. Yep, this is why legumes (such as beans) and rice are such a staple in the Cuban diet. Okay back to my worries. Due to its food shortage and political climate, Cubans haven’t exactly been presented with the world of resources that other countries I have visited have. So the common belief is that the cuisine in Cuba is rather lacking. While they may not have every single thing that you are looking for, this isn’t true at all. Easiest way to go about your food journey throughout Cuba? Strategically choose paladares (a (the real restaurant scene in Cuba that started at a snail’s pace in the mid-1990s, when then-leader Fidel Castro allowed private citizens to open businesses in their homes--translated from Spanish literally means “Palatal” ) and avoid government run establishments at all costs. I have included an extensive food list in this blog post that are some of the best places to eat at in Cuba (Havana, Vinales, Cienfuegos, Trinidad)! Contrary to popular belief,transportation is actually pretty accessible in Cuba. I mean not accessible in the New York City sense of subways and trains all around, but accessible in the sense that it is a whole industry. IMPORTANT NOTE: Negotiate the price of your transport BEFORE you get in and confirm it. One of the biggest ways drivers scam tourists is if they do not negotiate the price at the beginning, so they know they are unaware of how pricing works. Gran Car - These are old Chevy's that have been painted yellow. They are the most expensive taxis. A trip in a Grancar will cost $30-50 CUC per hour. Cuba Taxi - These are state-run taxis. You can ask them to use the meter, but if you negotiate the price ahead of time, it may be cheaper than the metered price. Bici-Taxi - This is more common in cities like Havana or Camaguey. It is basically a pedicab aka a bicycle taxi and is quite a fun way to get around the city. It is also one of the cheaper ways to get around (just a few CUCs)! Viazul or Astro - This is more for intercity travel. I personally never used Astro (just Viazul from Trinidad to Havana), but they both run the same way. You can either purchase it online on Viazul’s website or at the bus station on the day of your trip. Note: I suggest booking your travel way in advance as they do tend to fill up rather quickly. Also, print your ticket out from where you are coming from as internet is hard to come by! More Notes: If you do decide to chance it and purchase your ticket on the day of your travel, get to the station an hour early! In general, just get there an hour early as you will need to cue up before the bus leaves. Ahhh the money situation. Cuba was perhaps one of the most confusing places I have traveled to in terms of currency. 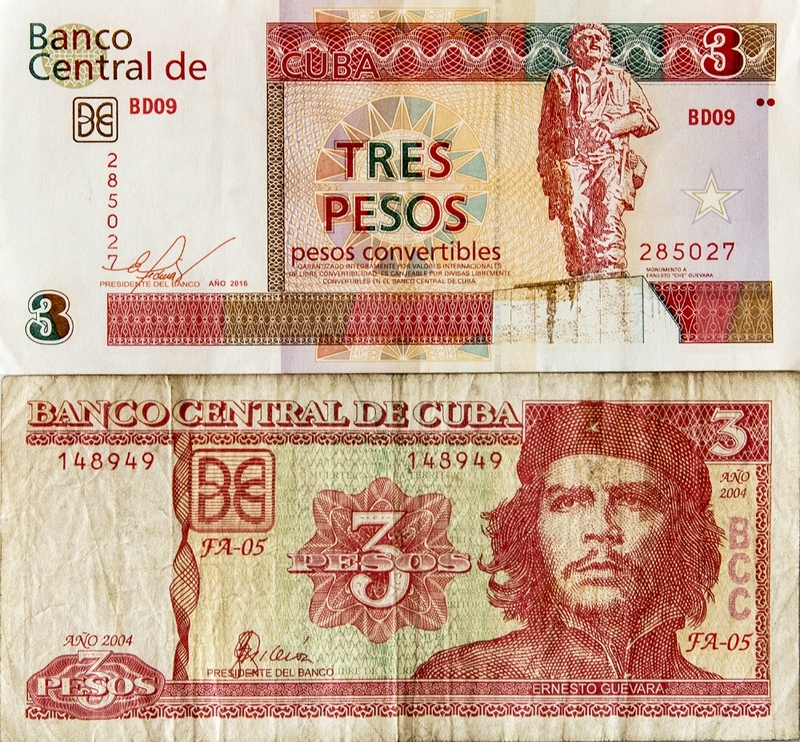 For starters, there are two different currencies in Cuba. One that is commonly used among tourists and one commonly used among locals. Where would you need this? Street food, flea markets, paladares (some), ice cream stands, colectivos, or giving tips. You can use CUC and CUP interchangeably throughout most places in Cuba, although note that the exchange rate is quite different! Most restaurants, bars, museums, taxis, stores (including local department stores), souvenir markets, lodging, and tourist transportation only take CUC. Note: If you are from the U.S. reading this, the money situation has a couple more hoops for you. Here are a couple things I did, that would be beneficial if you do it too (read: will make your life so much easier). Convert ALL your cash to CUC. As an American, you will not be able to use your card at any establishment throughout Cuba. Maybe there may be some places (probably not), but just in general if your card is linked back to the U.S., just consider it unusable in Cuba. Overestimate how much money you might need. Budget how much you think you will spend and add an additional $200. You can always convert your money back if you do not end up spending it all, but the last thing you want to be is stuck in Cuba with no money because you ran out and cannot use your card or withdraw money from an ATM. Try to pay for as many things as possible BEFORE you arrive in Cuba using your American card. I paid for all my accommodations and the majority of my excursions--bus fare, activities, etc. before I left the U.S. This helped me significantly as I did not have to worry about having to use my precious cash to pay when I got there. Airports -This is the easiest but also the longest wait time. I exchanged my money here and waited well over an hour. Cadecas or exchange houses in the city - There are many located throughout the city. The owner of your casa particular can usually point you to the nearest one. BFI and Banco Metropolitano banks - These are the only type of banks that give you CUC. Outside of this, most other banks only deal with CUP. Major Hotels - Hotels such as Hotel Saratoga or Hotel Nacional typically will exchange your money. If you didn’t already know, WiFi is scarce in Cuba. I mean there is a reason why the country is 50 years behind. They have very little connection to the outside world and up until very recently did not have any access to WiFi. As a blogger, I obviously need to keep up with emails and posting even on vacation so I did a lot of research as to where and how to find WiFi. First things first, WiFi is not free, cheap or easily accessible in Cuba. It is very much so a luxury. No matter what anyone tells you, understand this now: THERE IS NO FREE WiFi in Cuba. 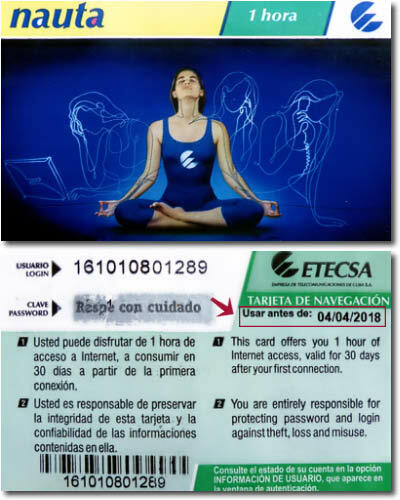 Prepaid Internet Cards: You will need to buy this to be able to access any of the Etecsa hotspots. They are sold at Etecsa offices, hotels, or your casa particular owner may have some. The cards typically come in 1 hour and 5-hour denominations and cost $1.5/hour (so that’s $1.5 for 1-hour card and $7.5 for a 5-hour card). Note: This is the price if you buy it from the office. Most places such as hotels will sell it at $2/hr or some places can sell it for up to $3/$4 an hour. ALWAYS log off after use! This prevents from using your precious internet time when you are not browsing. Other than the hotspots, one of the easiest ways to get access to WiFi is at big hotels. Connection is typically slow though as there are so many people attempting to use WiFi. I swear by this and bring it on every trip I go on! Make sure you know where your embassy is -- if you are from the U.S. and your money gets stolen, the embassy can help arrange for family and friends to transfer funds to you. AVOID AT ALL COSTS: Hopping off on the corner of Neptuno and Parque Central as you will be pegged a tourist immediately. Walk a block into Neptuno and get on there. When you see an almendrone raise your hand and the driver will stop. Don’t ask anything through the window, just get inside and sit. Don’t give your exact address. Simply state the street where you’re going and tell the driver when you want to get off. They don’t know exact addresses--just the area/street. Yep, no GPS’s here. Do yourself a favor and don’t ask how much. They will know you are a tourist. If you’re going to the tunnel, the price is 10 CUP. If you’re going to Miramar or Mariano have 20 CUP handy. Pay the driver just before you get off. It pays to have small CUP bills handy to facilitate the exchange. Notice I say CUP, not CUC. WHEW! This guide has been so extensive, but this is something I have been working on for ages. This is literally everything I know about Cuba--most of which I had to quite literally figure out on my own. I wish someone had done this for me! The planning process would have been 100 times easier. So as always, I truly hope this helps!